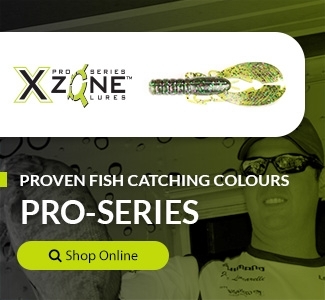 Working with Pro Elite Brandon Lester, X Zone Lures has been developing new lures for different conditions to keep anglers catching. The NEW X Zone Lures Pro Series Adrenaline Bug is a 4" soft body creature style bait that can be used for pitching, flipping for those hungry bass. By rigging this lure onto a 4 ought hook size you can pitch this lure into vegetation or through mats where the fish might be hiding and waiting to make a strike. This lure has floating craws so if you let it fall and rest, the craws will float and give a defensive appearance to the lure. This lure can be used year round and by pulling up on the lure with a couple of slight tugs, the lure will hop and create a vibration that will attract the fish. This versatile X Zone Lures Adrenaline Bug with it's contoured body and slight appendages can be used texas rig with tungsten weights for punching mats during warmer weather or fishing around structure in early season. The Adrenaline Bug can get into some tight spaces where those fish might be hiding by adding a heavier weight. 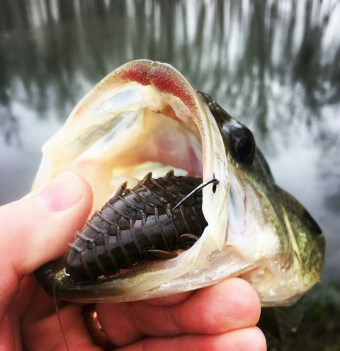 With a lighter weight the lure will glide into areas of structure such as fallen logs and will present a lifelike crawfish. Made with soft plastic but a strong structured appendix, this lure will not only help you attract the fish but keep them on long enough to reel them in. Be sure to check out the 11 colors that it is available in and try throwing one this season. Take a look at this video created by X Zone Lures Pro Elite Brandon Lester at the recent Bassmaster Classic where he discusses this lure in more detail. With over 40 years of bass fishing under my belt, it takes a special bait to surprise me. I'm constantly trying new baits and techniques because you never know when the next generation form factor will come along, like the curly tail grub, the tube jig, or the senko. A few years ago, Mark Kulik introduced me to his new Slammer drop shot bait, and that in turn introduced me to a world of new techniques.